Welcome the Amish 7 Spindle Windsor Dining Chair into your dining room collection. Offering true beauty and charm within its simplicity, this solid wood chair resembles the original Windsor design of early American homes. The use of seven spindles represents the traditional design of the Windsor chair beautifully. These spacious dining chairs allow you to lean back in comfort when your meal is finished and you stay to chat. This colonial style furniture is conservative and elegant and blends well with country style furniture collections. These dining chairs are available in six different wood types and the stain of your choice. Choose the simple leg style shown here or choose a fancier option. Consult our helpful blog post, "DutchCrafters Ultimate Guide to Choosing the Perfect Dining Room Chair," for guidance in selecting the style that's best for you. 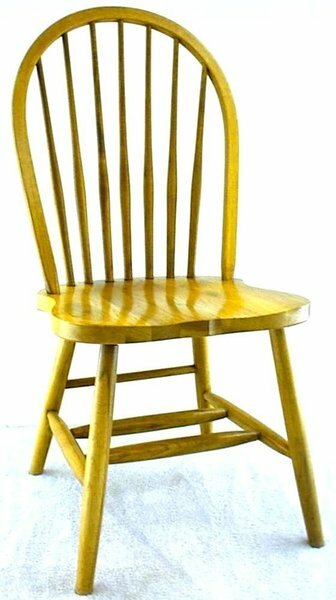 Skilled Amish craftsman who have been perfecting the art of solid wood furniture for a lifetime custom build these dining chairs here in America. This heirloom quality dining furniture will support fun family times now and for future generations to come. Take a look at our Reproduction Windsor Bar Stools in action in this quick video. We are here to help. Contact an Amish Furniture Specialist today with any questions about our solid wood furniture. Toll-free at 866-272-6773. Visit the DutchCrafters blog for more information on our Amish made chairs especially the Windsor style chair.